After a late lunch, we both are excited to start painting. 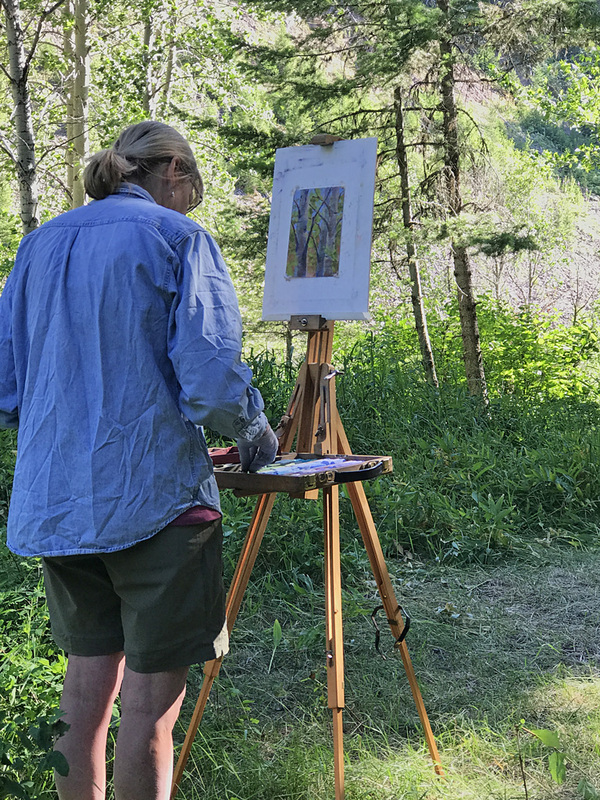 We decide to go back to Our Quiet Place to paint out of the wind and the sun. 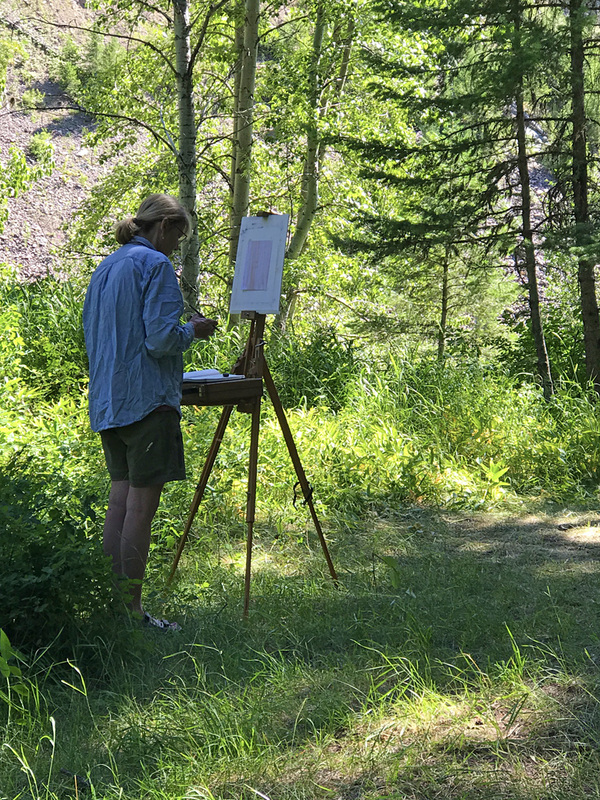 I start my first study which is a small pastel of the aspens that are on the perimeter. There is a greenish glow reflecting on the trunks from the light filtering through the leaves. It’s magical. I work for almost 2 hours and struggle to capture my vision. I’m not satisfied with the painting. I feel that there aren’t enough value contrasts between the shadows and the sunlight but that is what my eye is seeing. Perhaps I need to have more contrast between warm and cool color temperatures. I will have to think about it and I can try again tomorrow. It’s so great that we are here for days yet—we can come back at any point and revisit the scene. 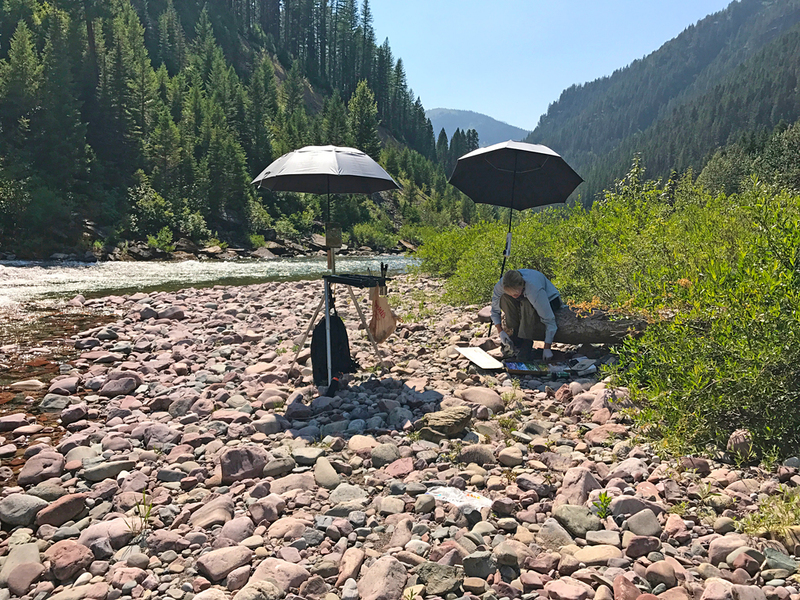 That is a luxury that is rare for almost all of my typical plein air sessions. Working on my first painting. I’ve made good progress and as you can see, the painting is fairly complete. Gini has been working on a black and white drawing of the tree grouping in Our Quiet Place. After working on her sketch, she makes a good start on blocking in her painting. She stops working at this point since the day is moving on and the light is changing. I continue working on my painting for awhile longer. Gini’s first painting. Step one is the black and white study in her sketchbook that you see below the painting. 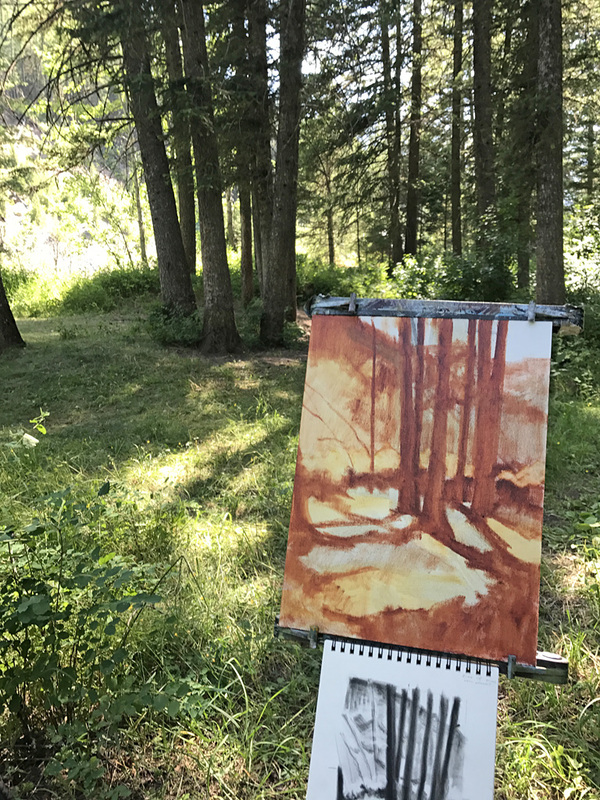 The second step is blocking in the painting on the canvas using burnt sienna. Notice the interesting shadow patterns. Gini has been industrious while I finished painting. She has collected wood and built a fire ring down on the beach. She has also started preparations for dinner. I join in and we bring metal folding chairs down to the beach. 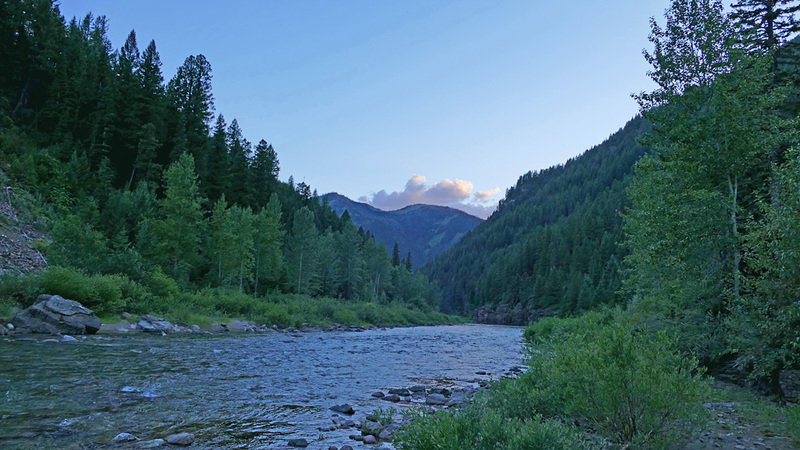 We crack open our first beer that we have been keeping cold in the river—so refreshing! We are now feeling that it was definitely worth the effort of carrying them in. We put out some appetizers and light the fire. Our riverside kitchen with boxes of paper and kindling. The rock face provided convenient shelves for our kitchen items. 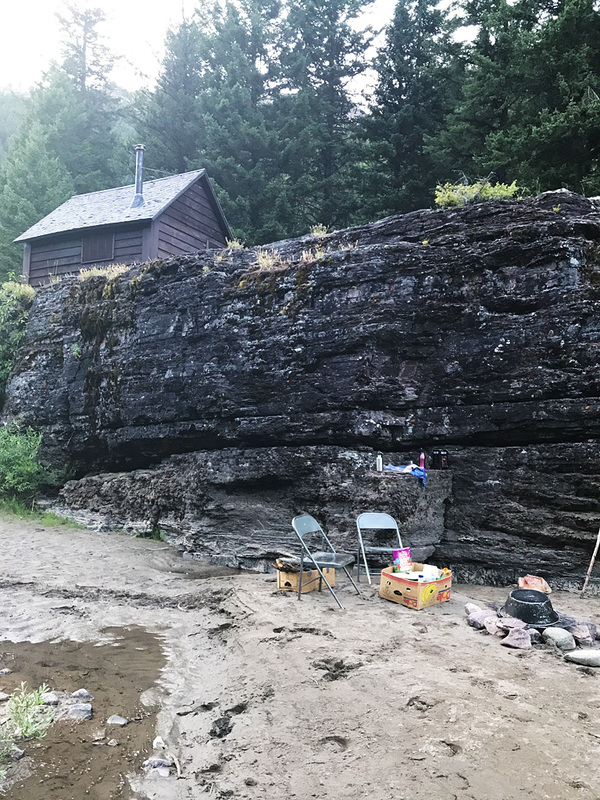 I should mention here that we were very careful to leave no trace as per our instructions from the Flathead National Forest rangers. After our 11 days, we dismantled the fire ring and buried the ashes. When we were done, you couldn’t tell there had ever been a fire pit here. Once the coals are red hot, we put Gini’s marinated chicken on. 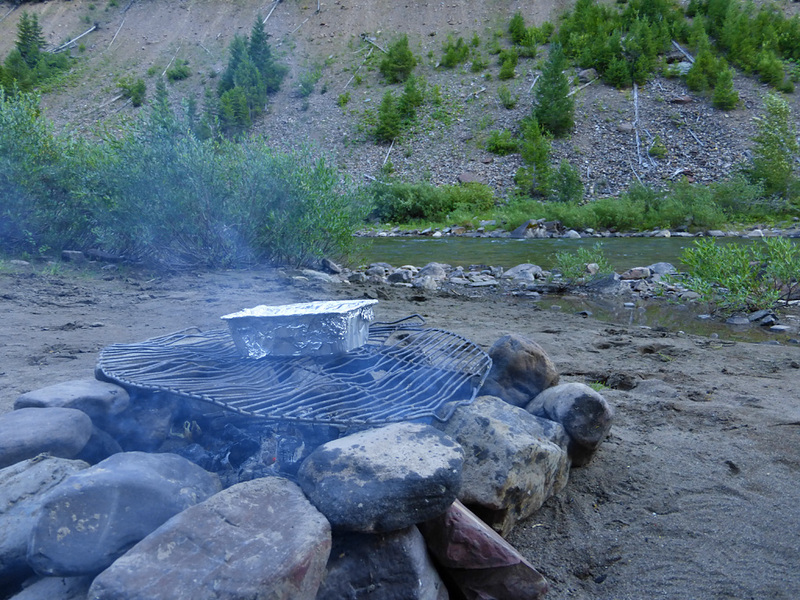 I boil corn on the cob on the propane stove up at the cabin and we have a delicious dinner on the beach listening to the soothing sounds of the river. Thankfully, the grill was part of the cabin’s accessories because we used it almost daily to cook our dinner. The colors reflecting off the river are amazing as the light changes. 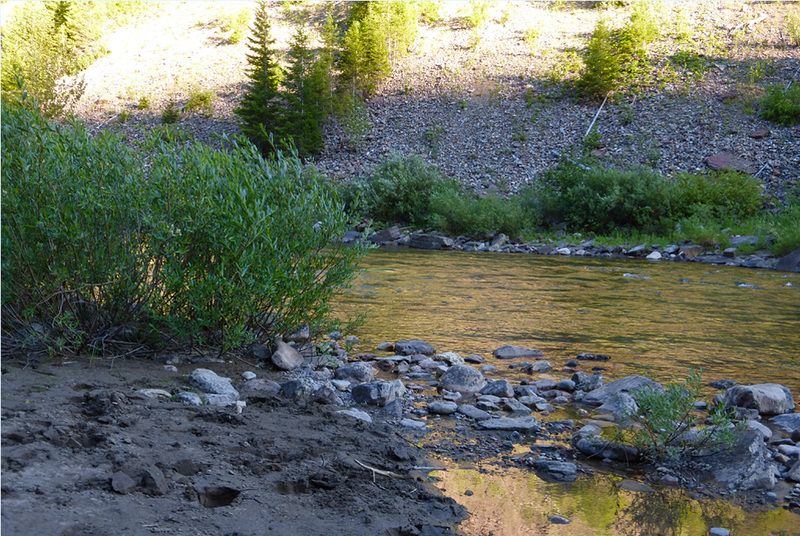 Opposite our spot on the river is a high slope of scree and in the evening for just a few minutes, the light bounces off the slope and reflects on the surface of the water. It’s stunning and I’m inspired by the light and colors. The magic of the evening glow reflecting on the river. A possible painting? I keep this in mind over the coming days. The sun falls behind the ridge and we talk until the stars start to twinkle. 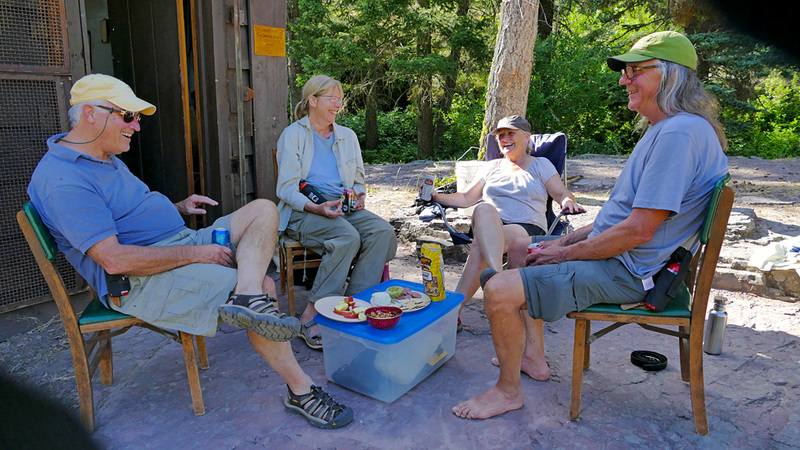 A great day—more relaxed and we’re definitely getting into the groove of camping. Looking downriver as the twilight comes on. I decide to record the animals we see each day and the wildflowers. I have a little book of wildflowers with me and most, but not all, of the wildflowers we see around us are in the book. Generally, we see the same animals and wildflowers on a daily basis but every now and again, we have a surprise visitor—stay tuned! Some bright yellow bird—a cardinal perhaps? 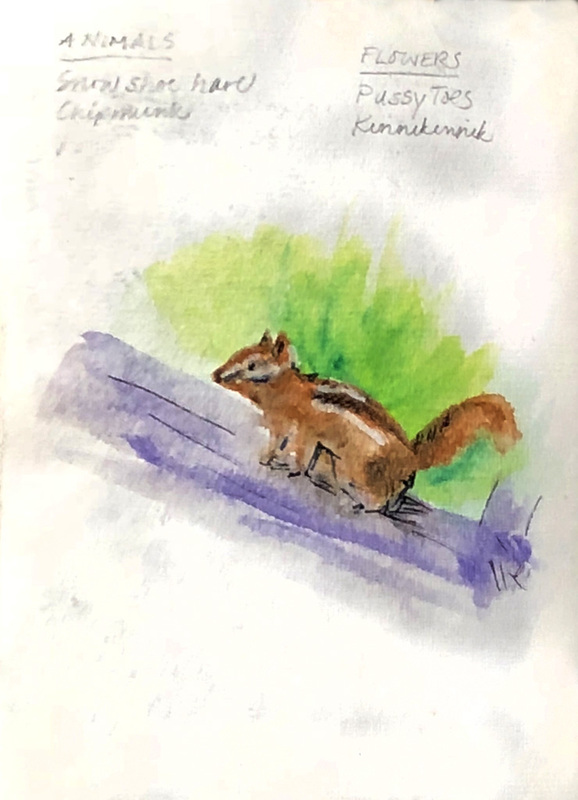 From my journal, one of the pages showing the list of animals and flowers for the day as well as a quick watercolor of one of our critters. Wonderful blog of your stay. Great descriptions and visuals. I would have loved to harvest some wild onion. Yum! Thanks for coming along for the journey, Steve! 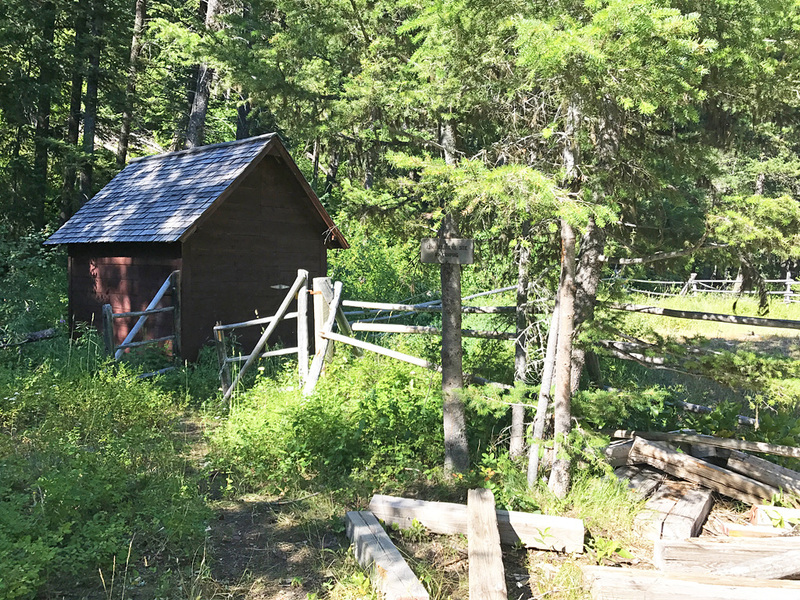 I’ll have to learn more about wild edibles before going out again—it would be fun to enjoy local cuisine! Love everything about this blog. PS Cardinals are red. Thank you, dear friend! Glad to know about the cardinals. Oriols? Thank you for letting us participate at your discovering the beauty of living in the nature. You’re a talented painter AND a talented writer as well. I’m looking forward to your next report ! So glad you are enjoying the adventure. Thank you for your kind words. It’s so much fun sharing the experience! Wow this is so thorough and descriptive, thank you , thank you! I am looking forward to “our” tomorrow! Thanks, Jules—so fun to have you along for the journey!